The drought and the winds continue unabated with the result that my garden on this Friday is looking pretty sad, in spite of my meager efforts to ameliorate the conditions that my poor plants have to deal with. Maybe it was the drought that made the 'Red Lion' amaryllis so late to bloom this year. 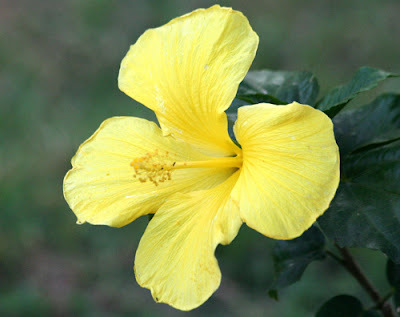 The 'Sunset Yellow' hibiscus has been in bloom for a while now. 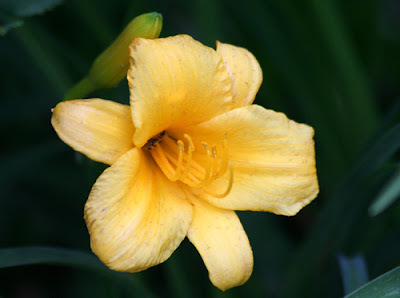 Its leaves keep turning sunset yellow, too, and falling off, but it just keeps putting on these blooms. 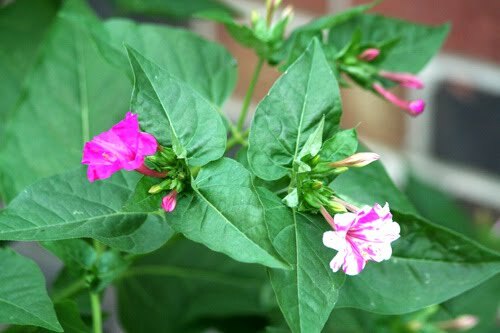 In the late evening and until the early morning hours, the old-fashioned 4 o'clocks send forth their variegated blooms. 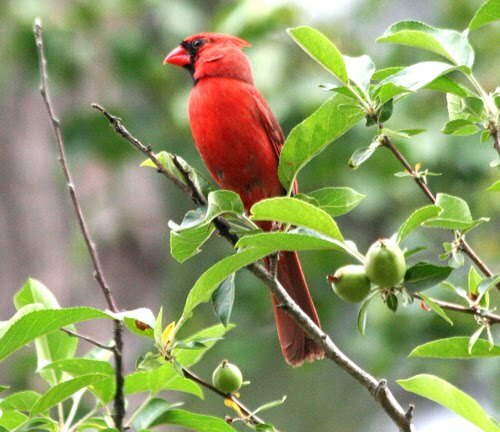 They are visited by hummingbirds in daylight hours and moths at night. 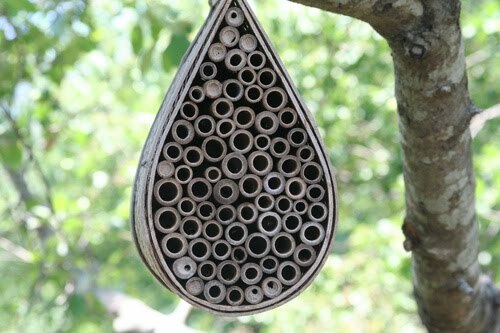 Did you ever wonder if native bees will actually use one of these manmade tube nests? The answer is, "Yes, they will!" The mason bees have been very active around this nest in the old apple tree this spring. I find it interesting that they seem to utilize the outer tubes first. I'm sure there is a scientific explanation for that. I just don't happen to know what it is. 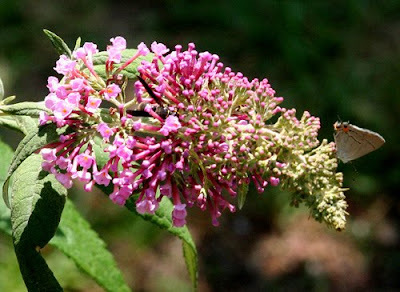 'Pink Delight' buddleia has begun its bloom cycle and has been found by this tiny Gray Hairstreak butterfly and a native bee, almost hidden among the florets. 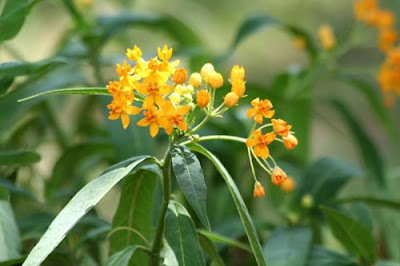 Most of the tropical milkweed plants are in full bloom now. 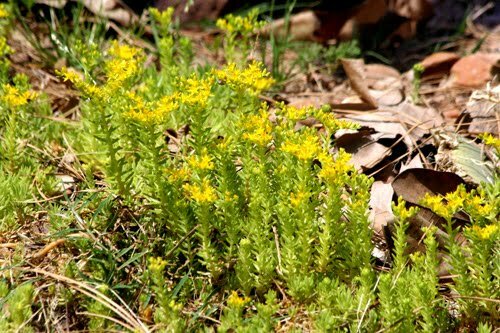 These were passalongs (the best kind of plants!) from my fellow blogger Butterhummer last year. 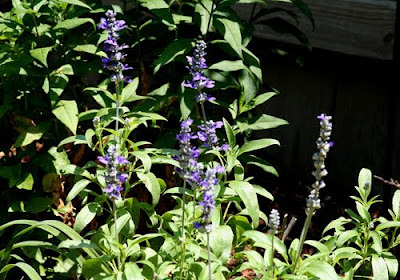 Next to Augusta's grave was her husband, Henry's, and the salvias growing there were purple. 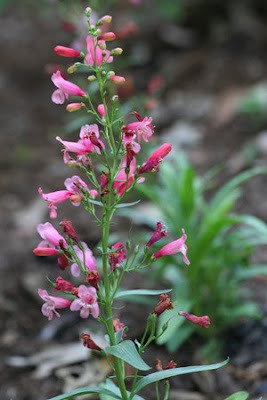 They became Salvia farinacea 'Henry Duelberg.' I grow 'Henry' and 'Augusta' side by side in my garden. 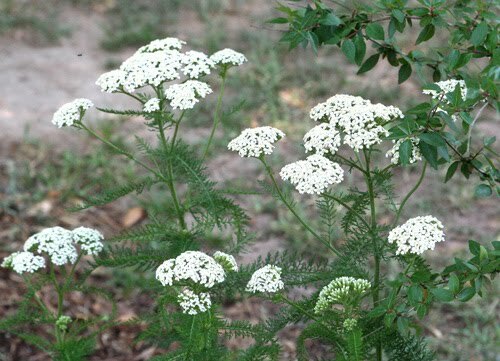 Another tough, drought-tolerant plant is yarrow. 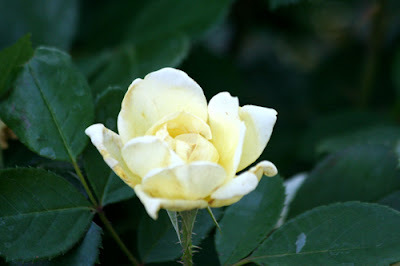 This white one was passed along to me by fellow blogger Ursula. 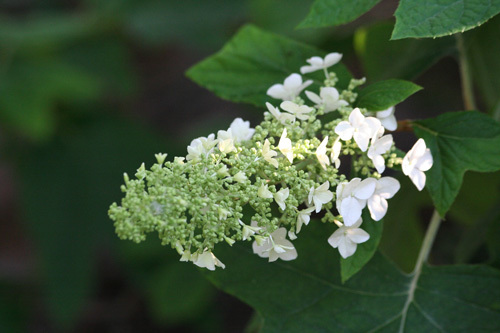 It can be invasive, but such pretty, delicate, cooling blossoms are worth a little extra trouble. 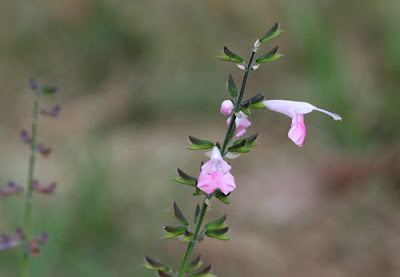 And speaking of tough, this is the plant that wrote the book. This is the genuine old tawny orange 'ditch lily.' 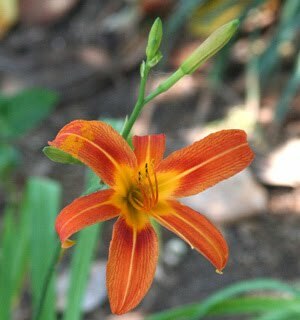 This is the first bloom of the year from the clump of plants that I dug several years ago from my mother's garden. 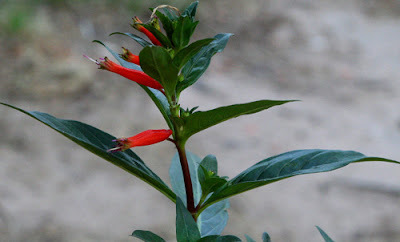 The little cigar plant Cuphea joins the orange parade. 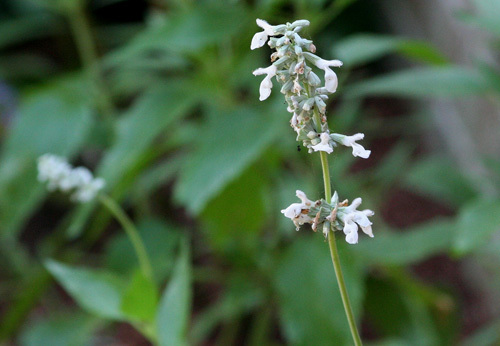 It has just a few of these tiny cigar-shaped blooms now, but soon it will be covered with them and it will remain covered with them until frost. The hummingbirds love these blossoms. The little red-orange gerbera raises its head above the variegated artemisia. The anole sits on a downspout that hasn't had anything significant flowing through it for months. 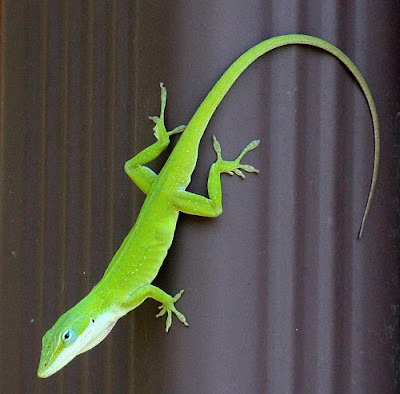 I find that when I water plants now the anoles come out to sip from the leaves. 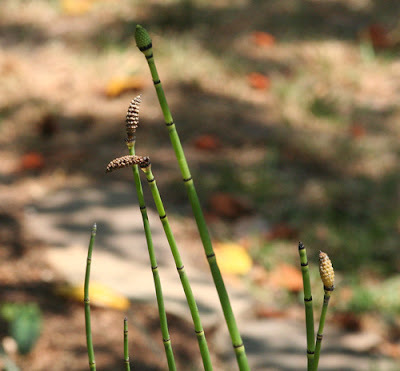 These horsetail reeds (Equisetum hymale) growing at one end of my little pond are developing these interesting "flowers," except they are not flowers really. The plant reproduces by spores. 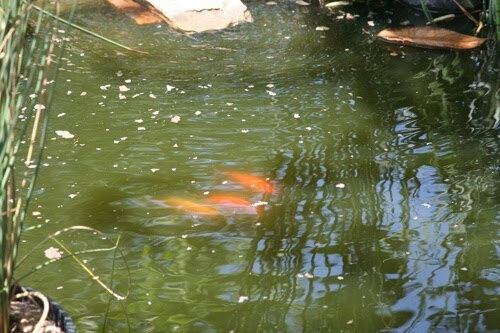 Nearby, three of my little goldfishes couldn't care less how horsetail reeds reproduce. They are more interested in how goldfish reproduce. In a bed near the 'Caldwell' another Salvia farinacea, the wonderful 'Indigo spires,' is beginning its long season of blooms. And on a post of the muscadine trellis, my little furry friend keeps watch over it all. 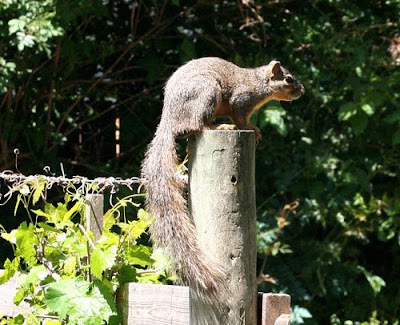 He'll have to wait a long time for those muscadines. We've almost made it to May and that is when, the climate scientists tell us, the dry La Nina phase of ENSO should begin to wind down and then we may have a better chance for rain. Let us hope it is so. Are you, like me, bummed out about the lack of good gardening shows on television? HGTV pretty much gave up on the "G" part of their name long ago. PBS used to have some good shows, including "Victory Garden," and in some parts of the country, they apparently still do - just not on our local KUHT. I don't know if the problem is a lack of money or if the powers that be at the station just don't think there is an audience for garden shows. They still show "Victory Garden" every Sunday but they have shown the same series of shows over and over and over for years now. If I see Jamie Durie make those bougainvillea trees one more time, I might just put my foot through the screen! It turns out though that PBS does actually have another gardening show that is available in other parts of the country. 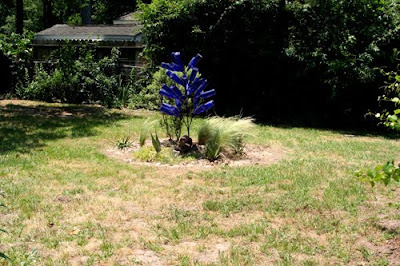 It is "Growing a Greener World" with gardener Joe Lamp'l. As far as I know, there are no plans for KUHT to start carrying it, but the good news is that through the power of the Internet, you can watch it anyway! Just click on this link and select the episode you want to watch and click on the title and you can watch the show right there on your computer screen. I've watched a few of the episodes already and I think the show is pretty good. Take a look and see what you think. Maybe some day this or other worthy gardening shows will again show up on our local television station schedule. Until then, thank goodness for the Internet! In ancient Greek religion, Asclepius was the god of medicine and healing. He represented the healing aspect of the medical arts and he had five daughters who were goddesses of five of those arts: Hygieia (Hygiene), Iaso (Medicine), Aceso (Healing), Aglaea (Healthy Glow), and Panacea (Universal Remedy). These names have come down to us through history and philology and we still honor them in today's language. We don't know whether there was ever a historical Asclepius, although some historians speculate that there was and that the mythological character is based on him. Whatever the truth of the matter, the mythological character was and is well-known to students of the classics, of which Carl Linnaeus was one. You may remember Linnaeus from your high school biology class. 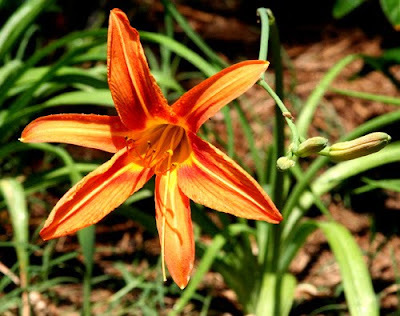 He is sometimes referred to as the "Father of Taxonomy" because he was the genius who came up with the system for giving scientific names to plants and animals. His system has stood the test of 300 years time and is still in use today. When Linnaeus was casting about for a name for the milkweed genus, he was aware that these plants have many uses in folk medicine, and so what better source for a name for them than a derivative of the name of the ancient god of medicine? Thus the milkweed became Asclepias. There are over 140 known species in the genus, Asclepias, but the one that is most often grown in our gardens is A. curassavica or tropical milkweed. 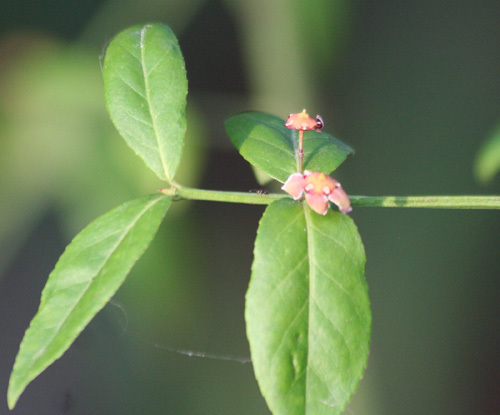 One of the tropical milkweeds blooming in my garden this spring. 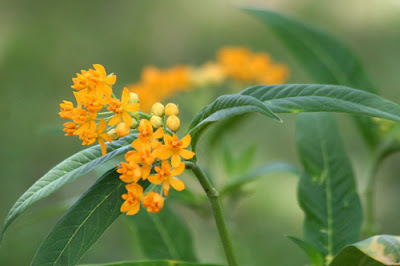 The native milkweed that I grew up seeing around our yard and along roadways and in fields was a bushy plant with bright orange flowers. 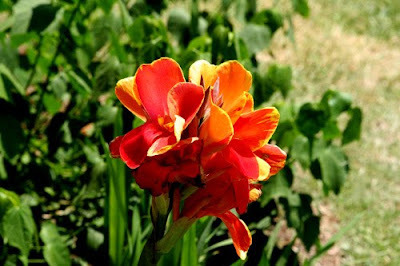 This is A. tuberosa. I have a couple of those in my garden, but they don't really grow as well here as the tropical milkweed does. 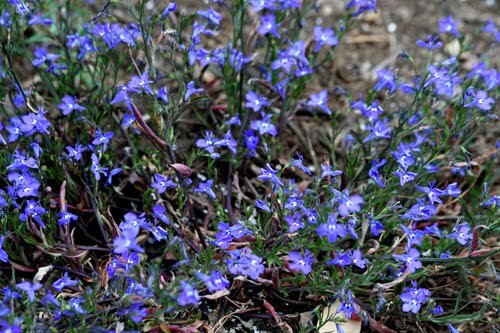 They were slow to return after winter and are now about 3-4 inches high but are a long way from blooming. The major interest of gardeners in milkweed today is not for its folk medicinal qualities but for its value to butterflies. 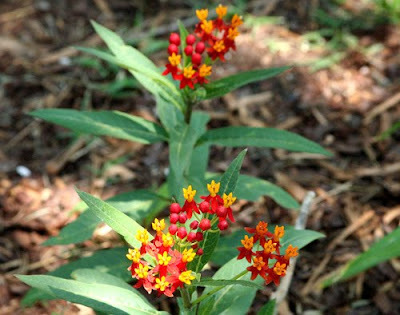 Milkweed is well-known as the host plant for some species of much-loved and highly desirable butterflies, namely the Monarch and the Queen. 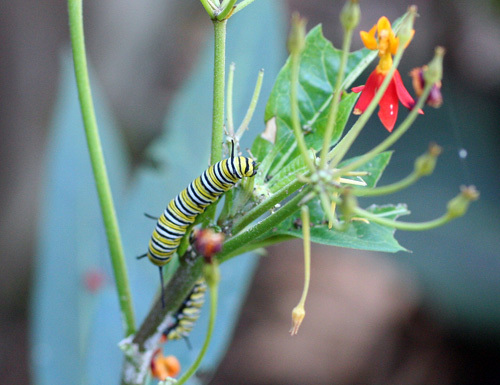 Hungry Monarch caterpillars munch their way through a tropical milkweed plant. 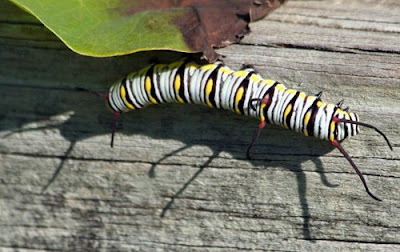 Even if the plant loses all its leaves to the caterpillars, it will come back and grow new leaves. The Queen caterpillar likes milkweed equally as well as the Monarch and, as you can see, looks very similar, except that it has a third set of antennae in the middle of its body. Here, in shadow, you can discern that third set even more clearly. As Monarchs, as well as other butterflies, have suffered setbacks in recent years because of natural events and human-caused catastrophes, gardeners throughout the country have responded by planting more and more milkweed. 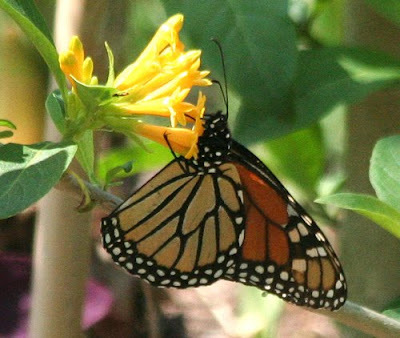 By now, there is a well-defined trail that Monarchs can follow through gardens right across North America, from the mountains of Mexico to the plains of Canada. 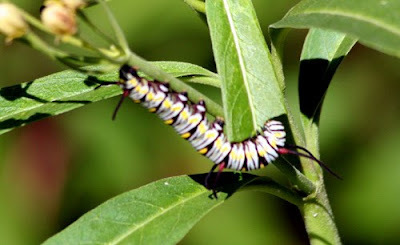 On this Earth Day 2011, I celebrate all those gardeners who care enough to plant milkweed, even though it may not be the prettiest plant in the garden and it may go through its life with leaves full of holes. It is a plant that lives up to the root of its name - a god of medicine and healing. 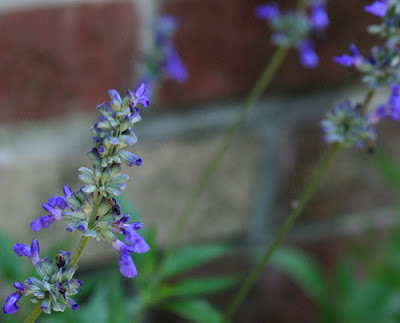 It has the capacity to help heal the environment and to heal the gardener's spirit as we happily watch those caterpillars destroying our plants and know the beauty that is to come. Welcome to my garden. So glad you could stop by. 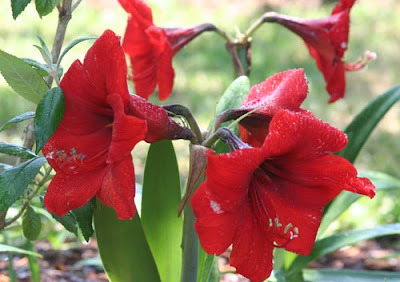 Let's see what is blooming today, shall we? 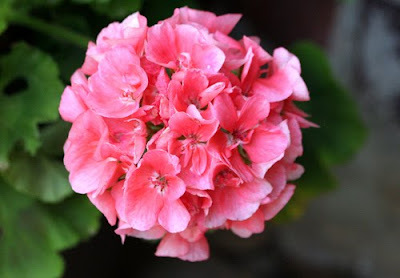 As we step out the front door, the first blossom we encounter is that of the coral geranium that has been blooming in a pot by the door for weeks now. Love those geraniums! 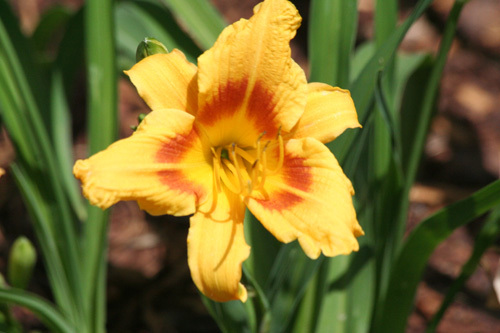 April marks the beginning of the long daylily season of bloom. The first ones to open their smiling faces in my yard are in the yellow family like this one. And this slightly fancier one. And, of course, there is the much maligned 'Stella d'Oro,' disdained by many gardeners because it is so common, but I'm fond of its happy, sunny blooms. 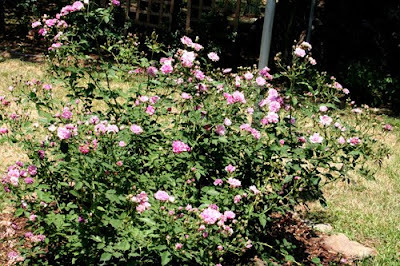 The old 'Caldwell Pink' roses got pruned very late this year and are now struggling to catch up to all the other roses that started blooming weeks ago. 'Caldwell' is just beginning. 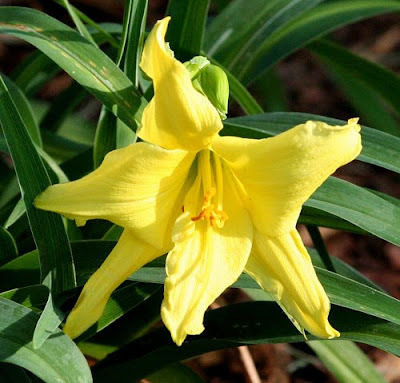 The yellow Knockout, 'Radsunny,' is on its second (or is it third?) flush of blooms already. 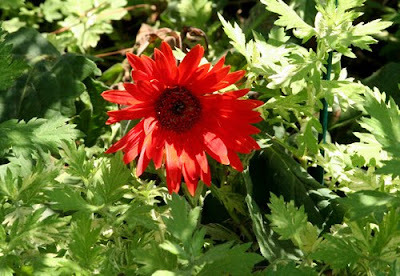 One of my favorites, the miniature bloomer 'Red Cascade,' is almost in full bloom now. 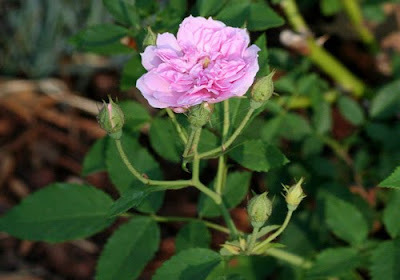 The "miniature" appellation refers to the size of the roses which are tiny, but the climbing plant itself can get rather large, and it blooms in my yard almost continuously from now until the first killing frost in December. 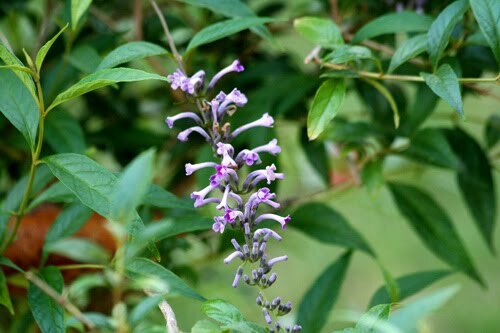 The first buddleia to bloom this year is this old heirloom passed along to me from a friend. 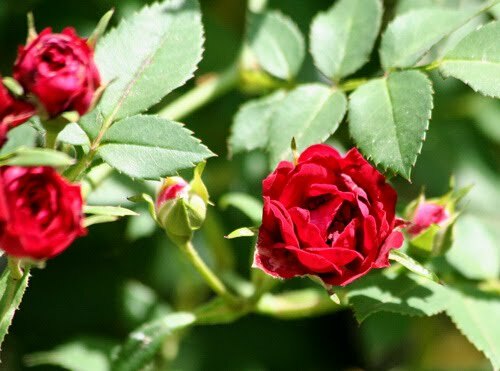 It was originally from her grandmother's garden. My other more modern buddleias suffered a bit from the cold winter and are just now hitting their stride. This tough old girl never lost a step. 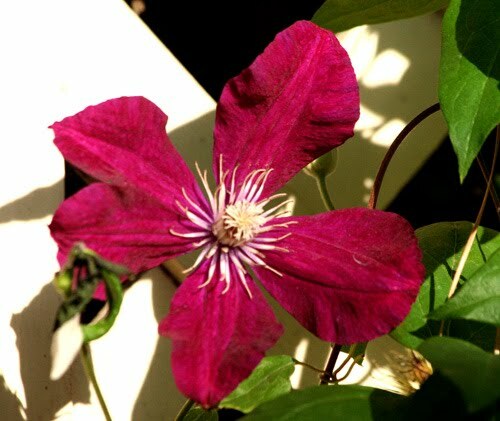 I'm very fond of this 'Rouge Cardinal' clematis that blooms by my back porch. It has been in bloom for a few weeks now. This Mexican sedum covers ground in various places throughout my garden - another tough and resilient little plant. My garden leans heavily on native plants, and pavonia (rock rose) is one of these. 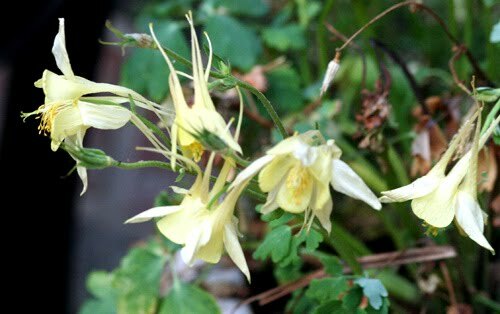 Columbines have been prodigious bloomers for me this spring. 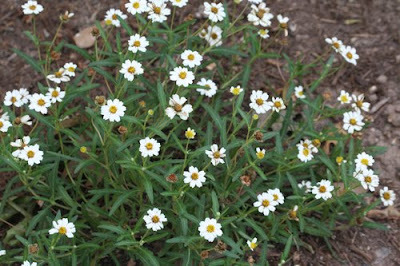 Another native, the Blackfoot daisies are full of their tiny blooms now. Nearby, the penstemons have also joined the party. Just starting to bloom is my favorite hydrangea, the oakleaf. 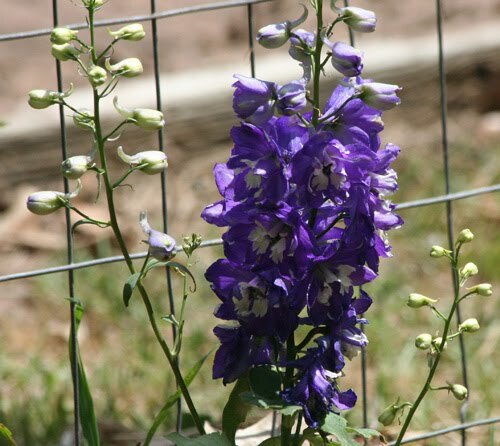 These delphiniums that I picked up at Antique Rose Emporium last week and planted next to my vegetable garden fence have popped into bloom already, perhaps just a bit prematurely. I love that color! 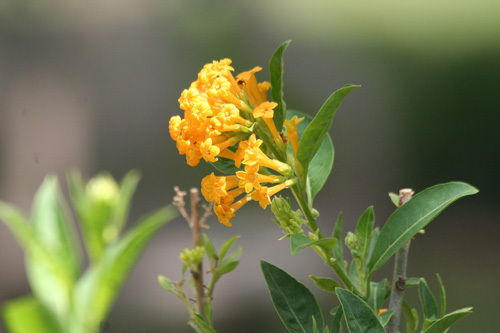 The yellow cestrum has been in bloom for several weeks. The butterflies just adore that cestrum! 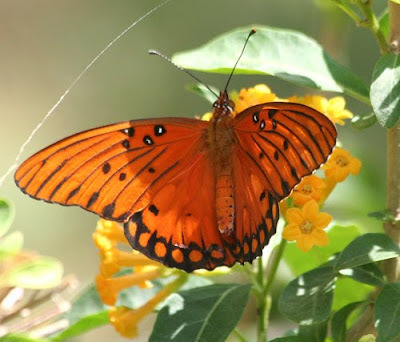 This is actually the very first Gulf Fritillary I have seen in my garden this spring. I think it visited every single blossom on the cestrum. I've really come to like this 'Coral Nymph' salvia which has also been blooming for awhile and still sports a few Bloom Day blossoms. 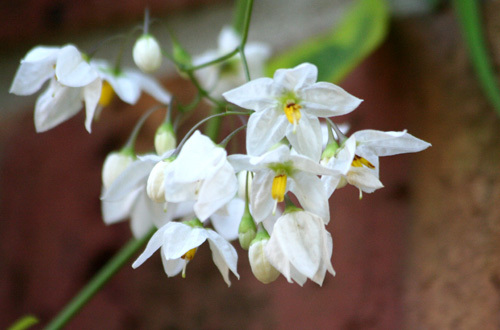 The variegated potato vine next to the garage door is simply covered in these dainty little white blossoms. Strawberry bush sports a profusion of very unobtrusive but, I think, very attractive little flowers. 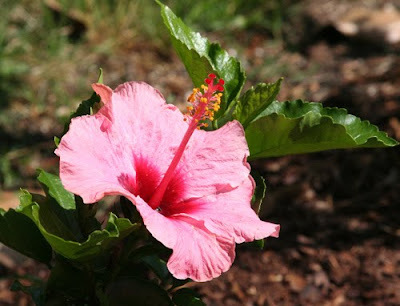 Nothing unobtrusive about the blossoms of the hibiscus. 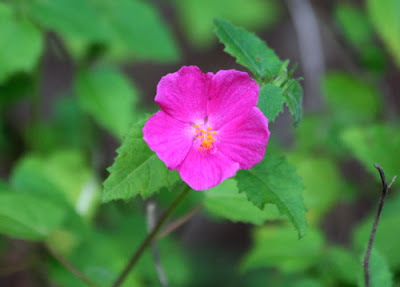 This is 'Candy Wind,' my first and so far only hibiscus bloomer. 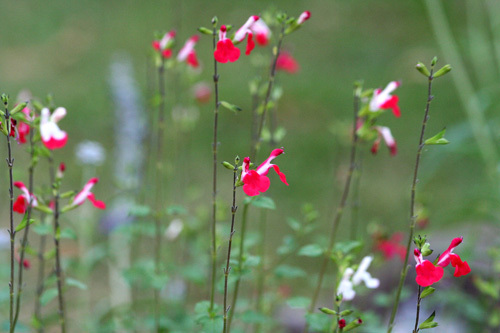 'Hot Lips' salvia dances in the breeze. We've had plenty of those this month, drying out our already dry gardens even further. This little lobelia spreads its deep blue flowers over the bed where it lives. 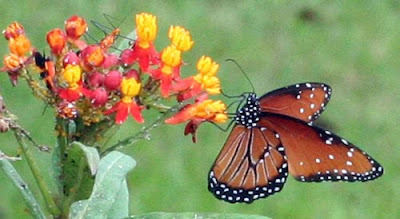 My several asclepias plants have had a steady stream of Monarch butterfly visitors in recent weeks. 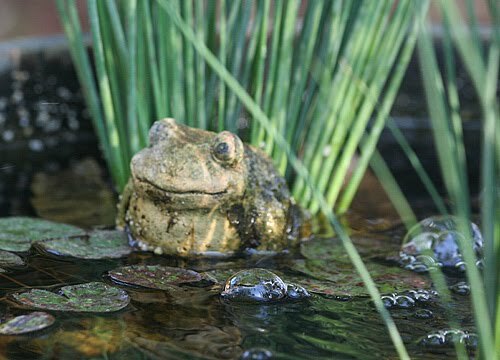 And from his station on a rock in my little backyard fountain, my friend, Ribbit, watches over it all. 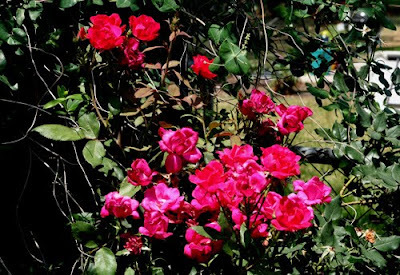 Don't forget to visit our hostess Carol at May Dreams Gardens for links to other bloggers participating in this month's Bloom Day. And a very happy April Bloom Day to you! What some people won't do for a green lawn! Blooms are bustin' out all over!